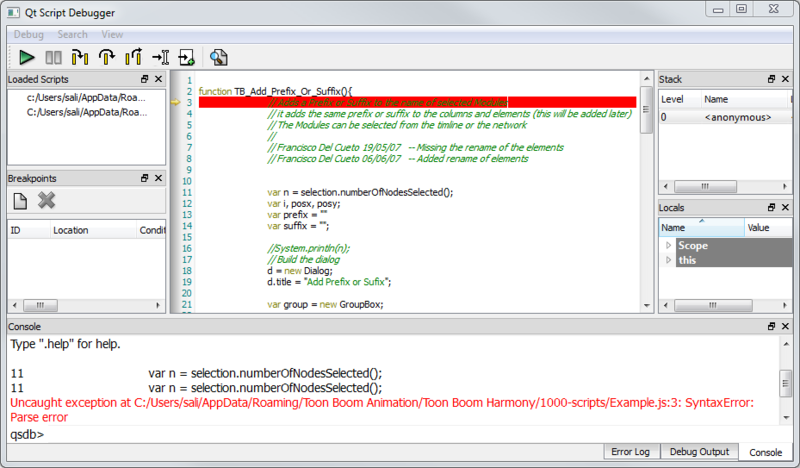 Use the Script Editor to create Qt scripts for Harmony. 1. 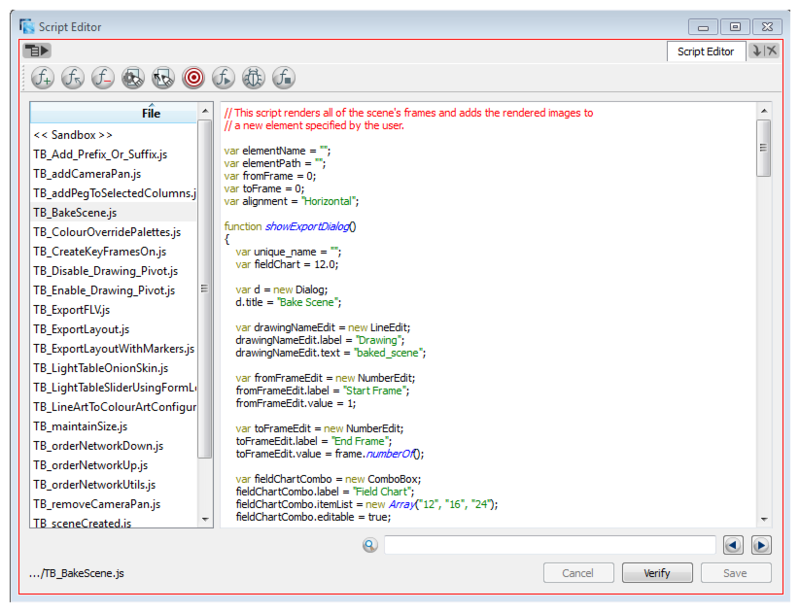 Open the Script Editor by going to the top menu and selecting Windows > Script Editor. 2. From the View menu select File > New Script or from the Script Editor toolbar, click on the New Script button. 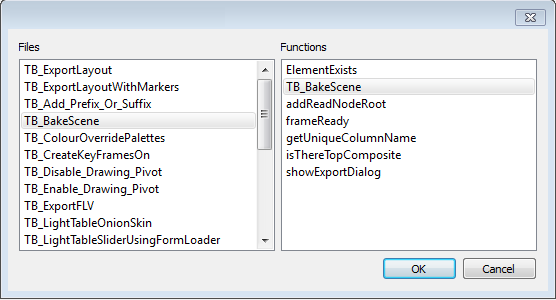 (If you do not see the Script Editor toolbar, go to the top menu and select Windows > Toolbars > Script Editor). 3. Enter a name in the Enter name of new script field and click on OK.
‣ Click on the User button to store the script into the user profile so the user can always access the script (/usa_db/users/user_name). ‣ Click on the Global button to make the script available to all users from any scene, job and environment (/usa_db/scripts). ‣ Click on the Environment button to make the script available to all users when working in a scene from this particular environment (/usa_db/environments/environments_name). ‣ Click on the Job button to make the script available to all users when working on scenes from a particular job (/usa_db/jobs/job_name). 6. To check your syntax, click on the Verify button. 7. To test your script, select the function you would like to run from the File column, then, from the Script Editor toolbar, click on the Run button, or from the View menu select Play/Debug > Run. ‣ A window opens to ask you for the target function to run. In the window, select which function you want to execute. To avoid selecting the function every time you want to run your script, you can set a target function. In the Script Editor toolbar, click on the Set Target button, or from the View menu select Play/Debug > Set Target. In the Function column, select the function to target and press OK.
‣ To stop the execution of your script, click on the Stop Execution button. ‣ You may receive the message: Only functions that have been saved or are explicitly called will be executed. This usually occurs if you did not select the function you wished to run from the File column before running the script. In this case, click on the Save Changes button, then try running your script again. This is because the software jumped to the <<Sandbox>> item in the Function column. 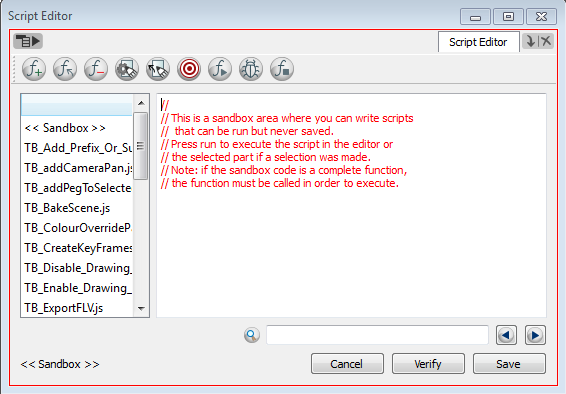 The <<Sandbox>> is provided to test scripts without saving them. Simply click on your newly created script and then try running it again. A new 3Dpath column (or 3 separate x, y and z path columns and a velocity column) will appear in your Xsheet view with the name ColumnName. You should back up your scripts if they are placed at the Global location because every user opening a scene gets the rights to them and if a problem arises it can corrupt the saved scripts. 1. In the Script Editor, in the File column, select the script that you would like to delete. 2. 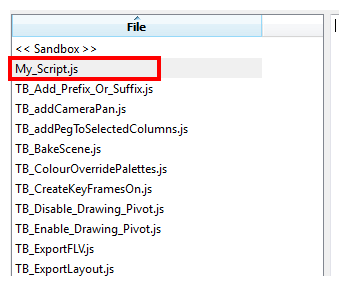 From the Script Editor toolbar, click on the Delete Script button or from the View menu , select File > Delete Script. 1. Debug: In the File list, select the script containing the function to debug.From the Script Editor toolbar, click on the Debug button, or from the View menu , select Play/Debug > Debug. 2. 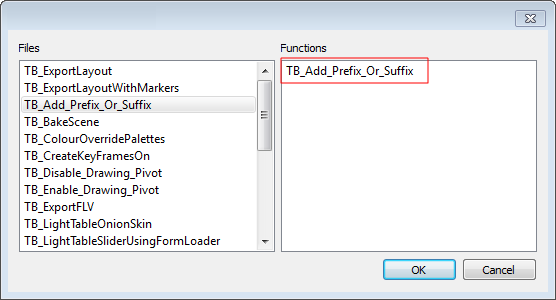 In the Functions column, select the function to debug.